I would like to take this opportunity to wish Michelle's first born a very Happy 22nd Birthday today. 22 years ago today, Chad Richard Collins blessed the life of Michelle and became her first born. If you happen to run into Chad today or feel the need to wish someone a very happy birthday, make sure you call my home phone at 304-285-8248 and wish Chad the very happiest of birthdays. Whether you loved him or hated him, Senator Robert C Byrd is arguably the single most influential politician in the history of the State of West Virginia and one of our nations most storied Senators. 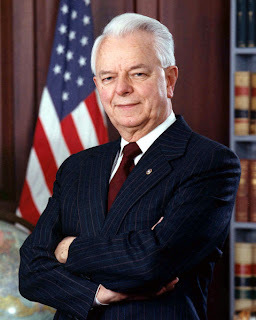 I heard the news yesterday morning when I woke up, Senator Robert C Byrd had passed away at the young age of 92. 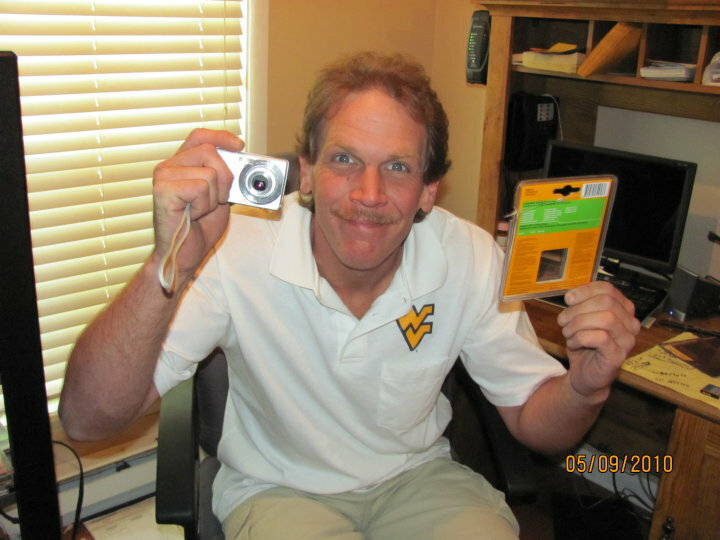 A day when the entire state of West Virginia lost it's biggest voice we have ever had in Washington. He was called the King of Pork, earning the name for all the federal Money he funneled into my beloved state from his high ranking position in Washington. I'm not sure you can drive anywhere in the state without seeing his name or something he has placed his stamp on. Senator Byrd was a man I had a great deal of respect for, and he will missed. Thank You for your service Senator Byrd. All good things must come to an end, and that even includes weekends with nice weather. 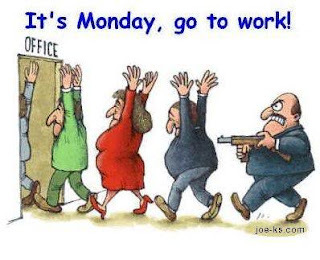 Yes it is Monday and time to return our noses to the grindstone and get back to work. This coming weekend will be a holiday weekend for me, so I am looking at the face of a nice three day weekend. However in order to get that the next weekend, I have to get this Monday over and done with. Michelle and I went and saw arguably one of the funniest movies that I think I have ever seen in a theater yesterday afternoon when we went and saw the new Adam Sandler movie Grown Ups. If you are looking for a movie that will have you laughing your rear end off, this is one you won't want to miss. No softball games this week for us, we are off this week with an off week and will return to action next Tuesday night. Sunday morning and all is quiet in the house, I'm up watching probably the worst Adam Sandler movie that I have ever saw, Funny People just did not deliver what I thought it would. It's a star studded cast, but the storyline wasn't what I anticipated. 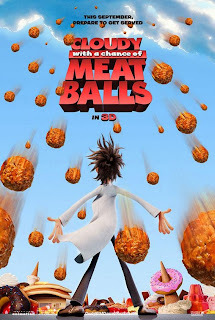 I'm still a huge Sandler fan though, I guess every movie can;t be an out of the park home run. We had a real nice walk yesterday at Cheat. We did a little over 4 miles and got to take in some really nice scenery. If you have never visited this portion of Cheat Lake then you don't know what you are missing. It's a piece of Morgantown's hidden or little known beauty. Grocery shopping on our agenda for this morning, getting back to our typical Sunday morning routine as we have had it altered the past few weeks. Michelle submitted her Pampered Chef order yesterday and everything should be shipped here within about ten or so days. Once we get it we will distribute everything to everyone who made an order. Surprisingly we did quite well for as little of a time period that we had. She will probably do another book party or host a party next year. It's a quality product that sells itself and brings it's own return customers just on that quality. I think to beat the heat today, we are going to hit the trails earlier than we usually do. WE bought a couple of fanny packs last week with a couple water bottle holders and I think we are going to pack up the GPS, the water and some snacks and head to a new trail today. I was thinking about going to the very scenic backwaters and walking on that trail. WE usually hit the one around Van Voorhis, but maybe a little change of scenery today could be a pleasant surprise to look at on our tack along the lake. The days forecast is calling for the temps to be in the 90's, so we want to get out and get our exercise in before those temps get too high and we can;t enjoy ourselves. 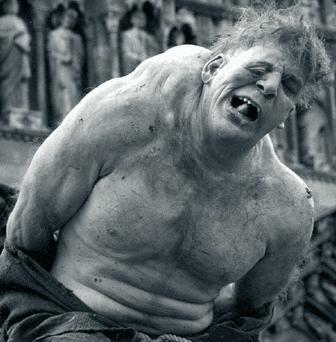 First off if you are reading this on Facebook, and it's not Friday, there is something screwy going on with my feed. I can't even manually get it to read the feed. Now on with your normally scheduled Blog. Looking for a little cheap as in free entertainment tonight? Movies on the Mon returns tonight at the Hazel Ruby McQuain Amphitheater with the playing of the remake of the movie Fame. So bring your lawn chair, some popcorn and your favorite beverage and enjoy a night under the stars with a nice movie....weather permitting. I got a call yesterday afternoon from my Brother in law Robert saying that Kim had been in a car accident and that he was still on the scene, but Kim was being transported to Ruby by Ambulance stabilized on a board. On her way home yesterday she was stopped due to traffic a couple miles from her house, when a car came up from the rear end and hitting her Subaru and knocking her into the car in front of her who was also stopped. Michelle and I met her at the Emergency Room to check up on her. She was banged up and in pain, they had her neck braced and she was in obvious pain. They ran a few tests and nothing was broken, but she was pretty banged up. The sent her home last night, but something tells me she will be off the rest of the week healing. She is OK, there is no damage or broken bones other than being banged up. The car on the other hand, had to back two doors pushed forward and they can not be closed. Her car will be out of commission for a while, Brittany get's her car back today coincidently. I didn't want to alert or alarm anyone yesterday until I know more than I did, but by that time they were sending her home and she just needed some rest. 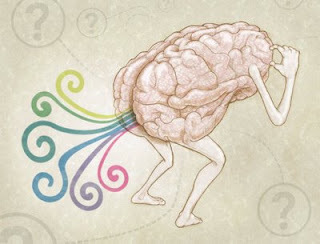 Do you know what you have to go through to find pictures appropriate to your blog title some days, sheesh. They have finally found Hayley's bag at the airport, the one that was supposed to come back with her to Pittsburgh on Sunday. Good Ole Delta, Michelle actually called the Montgomery Airport yesterday and they were basically like, "Oh, here it is". Wow, do you think you guys could have bothered to look by your feet sometime in the last 48 hours? I mean she came in Sunday at noon, and they found the bag, with little effort, yesterday after Michelle called. Unreal. Anyways, we finally got a little bit of rain yesterday. We didn't get anywhere near as much as we needed or as much as I thought we were going to receive. We got just enough to wet the ground for a couple of minutes before it evaporated everything again. As reported yesterday, we now have four kittens and hopefully the cat is now done having this litter. She had her last one early yesterday morning. * Well the final kitty tally is three, we have three new kittens from our cat Sophie. They are 40 days away from being weened and ready for a good home. * Day 830 for the Ed and Michelle first date count. * We played softball last night and lost a nail biter 7-8 with 2 outs in the bottom of the 7th inning. Came down to one final play and they scored from second base to win the game. Phil Caskey made his return after leaving last week in an ambulance. He's in pain, but is still doing very well. * I have decided, Justin Knapp can cover a whole lot of outfield out there in left field. He was making catch after catch and even made a couple sports center highlight type catches. * Michelle was under the weather again yesterday, she received a tetanus shot last week and it was sore and causing her to run a fever. Hopefully she will be OK when I wake her up in a few. * They still have not been able to locate Hayley's bag in Montgomery Alabama. Way to go Delta. 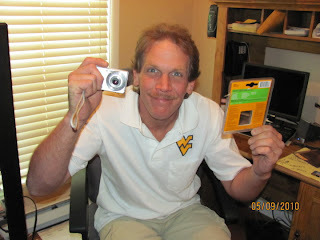 * I was walking around the DOE yesterday and looked out and saw my former brother in law Randy Hamrick doing some work. He said he left the University and was working for a contractor doing a few places around town, the DOE being one of them. 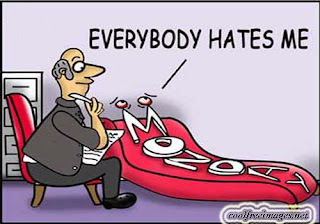 Is it Monday already? Wasn't it just Friday and the start of a weekend? Where did it go to, now it's back to work again, yikes. We went and picked up Hayley yesterday from the Pittsburgh Airport, she flew on Delta but her bags decided to stay in Montgomery Alabama. Yeah, Delta forgot to put her bag onto the plane and is still in Alabama. They are supposed to be bringing it up to us ASAP and if it's not here by the time we get off work we have a tracking number to get it. Sophie the Cat is no longer pregnant, so far there have been three kittens and two still borns and I don't know if she is done yet. Last year she had three, two live and one still born. Anyone want kittens? Oh well, in the good news department it is the first day of Summer. I would like to take this opportunity to wish all Father's a very Happy Father's Day. This just like Mother's Day has local origins as the First Father's Day Celebration was held in Fairmont West Virginia on July 5, 1908, two years before Spokane Washington held their first celebration thought the efforts of Mrs. Grace Golden Clayton despite what incorrect history may tell you. It was to honor those fallen in a mine explosion on December 6, 1907 in Monongah, West Virginia. Today Michelle and I will be going to Pittsburgh Airport to pick up Hayley who will be returning from a two week vacation in Alabama. We may even try to stop in and see some of her family since we will be in the area, but those plans are still incomplete. My home state declared it's independence 147 years ago today, on June 20, 1863. It is the only time in our nations history that one state has told another state "screw you, we are out of here" and it took the Mountaineers to do it. Happy Birthday to the place that I may not have been born in, but in the state I have lived the vast majority of my life in and considering myself a West Virginian. 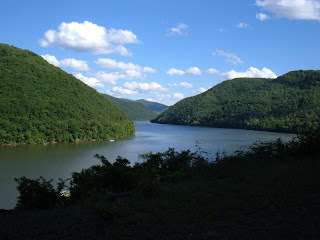 Happy Birthday West Virginia, my favorite state. Today is a special little girl's birthday, it is my Great Niece Erica Jean Nicholson's sixth birthday today. Make sure you take a little time out and tell her a happy birthday if you see her today. Val is going to have her birthday party in a few weeks so that she can have Josh's and Erica's birthdays together. I just have to say that weekends in the summer time are definitely my absolute favorite times of the year. Beautiful summer time weather to enjoy and not having to work, who could ask for anything more other than not really having to be anywhere at any certain time to throw on top of it. 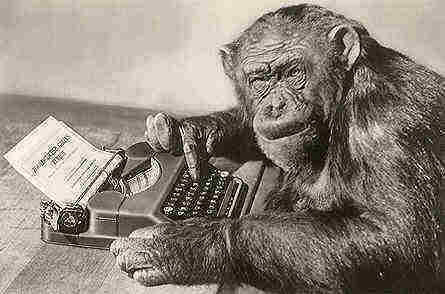 No major plans today so far, or at least not at the time I am actually writing this BLOG. Hopefully we can get out and enjoy the day, the fruits of our labors. Days like these are the ones you look forward to, days when all conditions are right and you can do whatever it is you want to do. Maybe there will be a Geocache associated with the day. Maybe a festival or even just a lazy day of taking a nap on a nice warm summer afternoon. What does this day have in store for me? Looking for a little buit of that free and or cheap entertainment tonight, Movies on the Mon returns this evening at Hazel Ruby McQuain Amphitheater this evening at dark with the playing of the Eddie Murphy comedy Daddy Day Care. Grab you a few snacks and your favorite beverage and head on down to the Mon river and enjoy a free movie under the stars. The next day the 10th AnnualArts on the River will be held at the HRM Amphitheater featuring fine music, dining and wine for all to enjoy. So if you are thinking about staying at home, just remember this past winter and how much you hated being stuck at home in the snow and get out and have a little bit of fun this weekend. * Two tidbit posts in one week? Surely you est, but no I just have a few things to address. * First of all an update on my softball team mate Phil Caskey. Phil was injured last night had to be carted off in an ambulance. He broke his Humerus in three placed and one broke off and T'd to the point that surgery was necessary. He had his surgery yesterday afternoon and there was no nerve damage, the surgery went really well and the plate was a very good fit. I'll update from time to time as information is available. * My sister Kim is getting her new dog today. I tried to unload a cat that has yet to be born on her, but to absolutely no avail. She is very excited and can't wait to get her Yorkie. * Update on Kennywod. Giant Eagle has tickets at a discount price if anyone would like to go. You have to plan on using the tickets Monday through Friday or there is an additional $10.00 surcharge at the gate to enter. If anyone is wanting to go, get with me or Kim or whoever so we can start coordinating a time. • $500 US Savings Bond provided by Clear Mountain Bank. • A Chance to beat Eric Maguire's poor dog. * Speaking of WVAQ, this Fridays half off hook ups is for Coal Country Mini Golf in Fairmont. * It was supposed to have rained the past week or so. I think every time I look at the forecast it has called for Thunderstorms. Now it's calling for it to be clear until next week, watch it rain now. Well that is two days down, working on this one and we have two days to go until we are at yet another weekend. 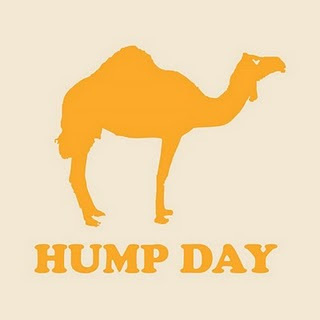 Don't get too excited yet, it is still only Wednesday, but it is over the hump day. Yesterday was a day of running to say the least. Both Michelle and I worked a normal day and turned around and ran out to the ballpark for an over the hill men's slow pitch softball double header last night. The first game we managed to pull off a nicely played defensive game and won a one run decision 5-4 to start out the day. We played the USGS and I recall that they beat us last year, so it was a little bit of revenge. Game two was us playing a team that hammered us last year, Classics 3. Once again we managed to win the game by one run in the bottom of the last inning 6-5. On the games next to last play, our right fielder who was trying to score the winning run in the last inning either separated his shoulder or had a clean break to his humerus. He was toted away by ambulance and I'll be checking on an update today to see how he is doing. We did sweep the double header which felt pretty good. * It's Tuesday, I can't think of a better reason to to a tidbits than that. * Good weather has continued through yesterday, I hope the weather holds out for tonight as we have a double header at the softball fields at 6:00 and 7:00 on Ogden Field. We have one single double header on the season and tonight is the night. Come on out to the ballpark and cheer us on, we need it. * What would a tidbits be without a count from mine and Michelle's first date which was 823 days ago today. * It's been 45 days since the engagement. Michelle is without her ring for the time being, her stone became loose so we took it to have it repaired. She noticed what she thought was a crack in one of the smaller side diamonds, but it turns out the main stone was loose so we sent it away for repairs. I was smart enough to buy the lifetime warranty for the ring for all repairs. * There are merely 193 shopping days let until Christmas this year. Maybe I should do a count for next seasons softball rather than something that involves snow. Have I mentioned I hate snow. * Talked to Mom briefly yesterday, she was under the weather over the weekend and told me she had some trouble walking Gabbie the night before as both she and Gabbie were attacked by another dog not on a leash. When I spoke with her she was resting and doing just fine. * Hayley is still on vacation in Alabama visiting her boyfriend Phil and his family. She'll be returning this Sunday. A week or so ago, my sister Kim had a suggestion of possibly doing a day at Kennywood Park where a bunch of family members could take a day and go up and have some fun. Only problem is ticket prices to Kennywood have gotten semi-ridiculous over the years and are $35.99 for adults and $22.99 for kids under 46" tall. Ruby Memorial has a special going on for employees where they can pick up tickets for $21.50 for adults and can only be purchased on June 23. Kim is going to check to see if there is limit of number of tickets she can buy (I would guess not), but if anyone might be interested we need to pick a date and arrange to have tickets purchased (Money to Kim) by the time she needs to buy the tickets. Seniors (over 55) have no limit on tickets, their price is $17.49 every day. If anyone is interested in a family day at Kennywood, let Kim know ASAP. Hey everyone, I think the weekends weather turned out better than originally thought. 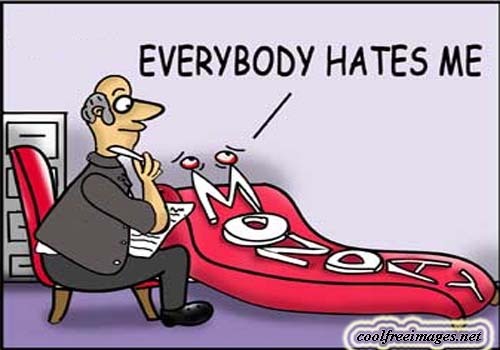 Sunday turned out to be a nice day for the most part, but Monday Morning has decided to rear its ugly face once again and start another week of sticking our noses to the grindstone and earning that living. Not much on my agenda this week as I recall, other than a softball double header tomorrow night. These will be out fifth game in eight days, and we'll have a downtime with one game in a three week time period after Tuesday night. We stopped up to see jean yesterday after the game, she had some pictures of mine from a number of years ago that she had found and wanted to return to me. Pictures from my Trip to the Coca Cola 600 12 years ago, a softball team pic nic and pictures from inside Helmick Corporation from when I used to work there 12 and 13 years ago all respectively. This past weekend was fun, but I can;t enjoy the next one until this week is over with. So I might as well get it started. It's going to be a day at the ballpark for us, as the rained out games are made up today. Thankfully for us we only have on game on the agenda for today that has to be made up. I know Michael really wants to beat these guys because they have came into the bar talking a lot of trash. Last night Michelle and I went to watch the WV Gladiators play for the first time in a couple of seasons. They went up against the WV Lightning out of Charleston and a team the Gladiators had lost twice to the past season. You could tell the Gladiators were not the same team we watched a couple of years ago. Many of the familiar names have moved on and a new bunch has filled their spots. When we left last night the Gladiators were losing 7-20 and that was near the end of the 4th quarter. After looking at the radar for the weekend I was quite sure it was going to rain all weekend. I may have to reassess that after looking at it again this morning. It's still calling for Thunderstorms today, but the radar is no where near as ugly as it looked yesterday. We could possibly have a better looking weekend weather wise than I anticipated. Michelle and I did a lot of running around last night right after work, half way anticipating that today would be rain filled and soaked. If the weather holds out, maybe there could be a geocache or two on the agenda for the weekend. 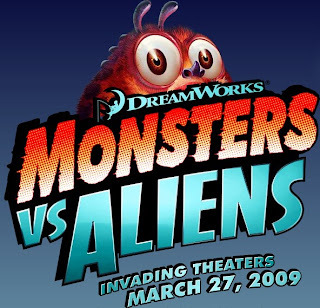 If you are looking for a little bit of free and cheap entertainment this evening, Movies on the Mon will once again be playing this evening at Hazel Ruby McQuain park and will be playing the movie Monsters vs Aliens. Michelle has been very much under the weather the past few days with some Migraine headaches. I think they have been barametric headaches that has been what has had her down. She was feeling much better last night and hopefully is herself again today. The weather for the weekend doesn't appear to be too cooperative, so you might want to make sure you get your outside fun activities in tonight before the rain dampens everything. We have a softball makeup game Sunday at noon. Hi ho Hi Ho let's get this Friday Started!!! 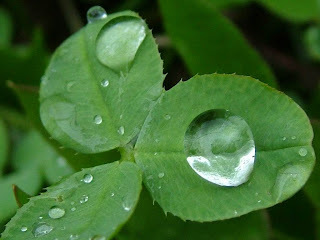 Yesterday we received some much needed rain to help cleanse the air. It renews and cleans everything giving us a nice spring fresh smell. I'm just glad we got our two softball games in this week on Monday and Tuesday. I still have a website that I need to develop again and I have been looking for ways to redevelop Shitzngiggles again, even though I haven't done anything with it for a while. I may just stick the old website back up there with the games. I've played with the idea of putting a topic specif blog there and I have played with the idea of throwing some type of a video site up. I've been looking, but nothing seems to have tickled my fancy as of yet. I have been looking at Hotscripts for something to put up there. Anything I guess is better than nothing. Well we have our softball games in for the week and the two busiest days for me this week are now behind me. Now it's just a matter of looking ahead towards the back part of the week and ahead to the weekend. I do have to say I have been busy, but the good part is the week has sped on by. I got an e-mail yesterday that I have been invited to Golden Colorado from August 10-12 for a Sequestration Seminar. The dates conflict with a Doctor's appointment and a A Jimmy Buffett Concert, so I'm not sure how hard I'll press to go to this one. Just the work worst time period of the year for me to travel across the country on business. A week before or a week after and everything would have been kosher. I may have to pass on this one though. We had a great time playing softball last night, we took out our frustrations from the evening before and it all came together last night. We pulled out a nice 14-4 victory as we strung together hit after hit all night long. It was a sparse lineup, I put our right center fielder in at shortstop by accident and he played very well. I even had to start the Wookie on the pitchers mound. Great job Chewy and Kevin in relief. * It's Tuesday, it's time for a quick tidbits. * Still counting, it's been 816 days since the first date with the love of my life and 39 days since our engagement. * Weather looks like it has and will hold out for a day or so more so that we can get both softball games in this week. We play again this evening at 6:00 following last night's 9:00 game where everyone and his brother seemed to be traveling, sick, had to work or had a death in the family. Maybe we can get a few more guys out tonight. * I saw my Doctor for the last time yesterday, I'll be meeting my new one in a couple of months when I go back. 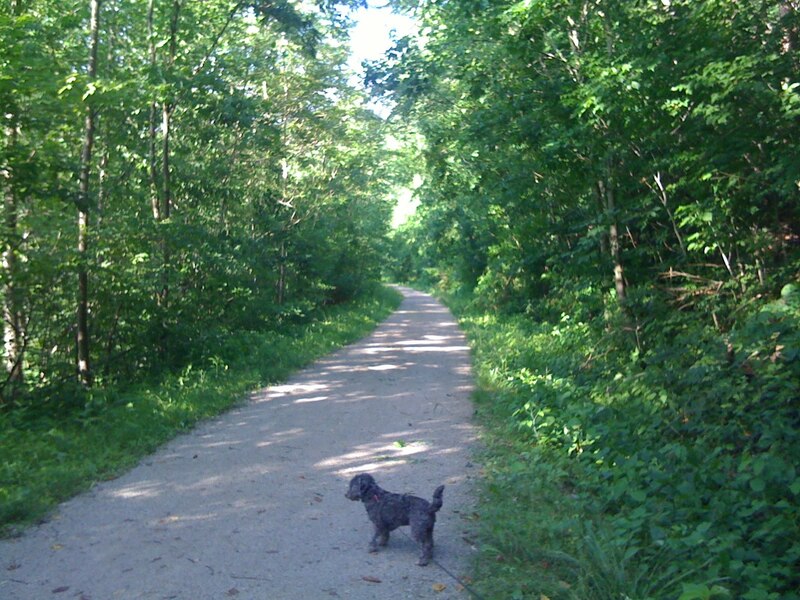 Well Sadie and I took full advantage of the nice weather yesterday afternoon with a stroll along the rails to trails yesterday evening to culminate our weekends activities. We managed to get lucky enough to find some gorgeous weather to take advantage of, so take advantage of it is just what we did. I did manage to get a few pictures along the route, I've shared one with everyone here. It's going to be a busy couple of days for us, this afternoon I have a Doctor's appointment and will probably be meeting my new doctor for the first time as I say goodbye to Dr. Feathers as he moves on with his career. After that we have the first of two softball games this week where I have no option but to be there. Chris is in Georgia, so I have all of the equipment and will be assembling the lineups the next couple of days. We play tonight at 9:00, and then return tomorrow night at 6:00 for the second game. Needless to say I will be busy for the next two days. A year ago we celebrated your 16th birthday with a surprise birthday party. This year you are in Alabama visiting Phil for a couple of weeks and enjoying the nice weather and the vacation. I have to say that I am quite proud of what she has done during this past semester, she has really busted her rear end. With the exception of the occasional door slam you couldn't ask for a better kid. Anyways Hayley is not here, but that does not mean I take a little time out and wish a very special girl a very Happy Birthday on a very special day. Happy Birthday Hayley, we'll celebrate when you get home. Well the weather hasn't been all that cooperative so far this weekend, but we have managed to make the most put of it so far. Friday evening Michelle and I went up to Mylan Park to see Kim and Brittany who were taking part in the Relay for Life event that they had then. It was actually the first time I had been to that particular facility and I was quite impressed with it. It was the first time I had been in that building. We drove up through the complex, and although she had been at that facility, Michelle said she had never been through the rest of the complex so we drove through for her to get a chance to see everything. Yesterday even though it was raining most of the day, we managed to go out and attempt to garner a couple Mystery Geocaches. We got the first one we had tried, but the second one we were having a bot of trouble with to to the leaf cover of the trees where we were at. It was causing the GPS to jump all over the place and we could not pinpoint where the cache was located. We will probably try that one again this fall after the trees lose their leaves. Mystery caches are comprised of puzzles you need to solve to get the coordinates, Michelle and I solved two yesterday morning and sought out to find them. The problem was however it had rained a good bit and by the time we were on the trails at 2:00, the temps were heating up and it was rather humid out there. 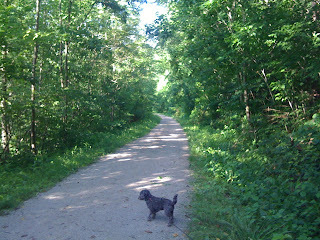 So, we did get out and manage to get a good healthy walk on the trails before heading home to some more rain. Hayley left early yesterday morning for Alabama, she arrived safely early yesterday morning and is enjoying a couple of weeks with her boyfriend. 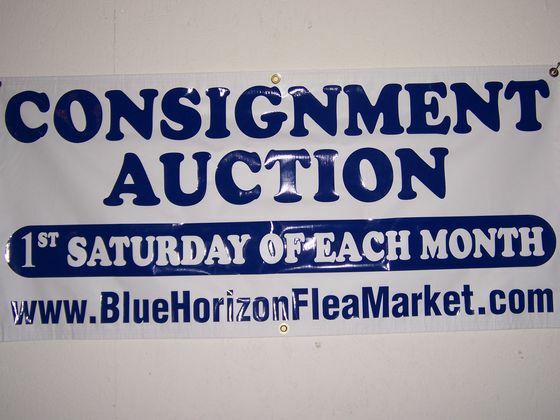 Jim Paugh and crew will once again set up their monthly auction at the Blue Horizon Flea Market behind Vance's Service Station this morning. 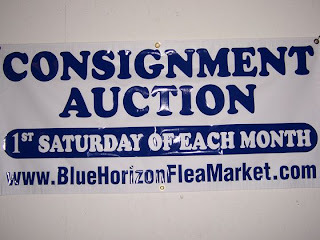 People may want to take very special note that the Auction will be starting earlier than normal today, it will be starting at 10:00 AM instead of the normal start they had and, this will extend throughout the summer as the rest of their monthly auctions will also be starting in this time slot. As always, there are numerous items up for bid today. So bring your money and do a little bargain shopping to see if you can find a nice deal to bring home for yourself. All kinds of tools, glassware and antique toys going up on the auction block today. I have to be the luckiest man on earth, because I have the best brother that anyone could ever ask for and today coincidently happens to be that particular brothers birthday. If you should happen to see my brother Gary today, make sure that you take a little time out and wish him a very Happy Birthday today. From the bottom of my heart, I would like to wish my favorite little brother the very happiest of birthdays. may all your dreams and wishes come through for you, especially on this day. Well Hayley is finally done with school for the school year, she finished up yesterday and will probably be spending much of today packing and getting ready for leaving from the Pittsburgh Airport at 3:00 tomorrow morning for Alabama. She will be going down for two weeks to see her boyfriend Phil and his family. 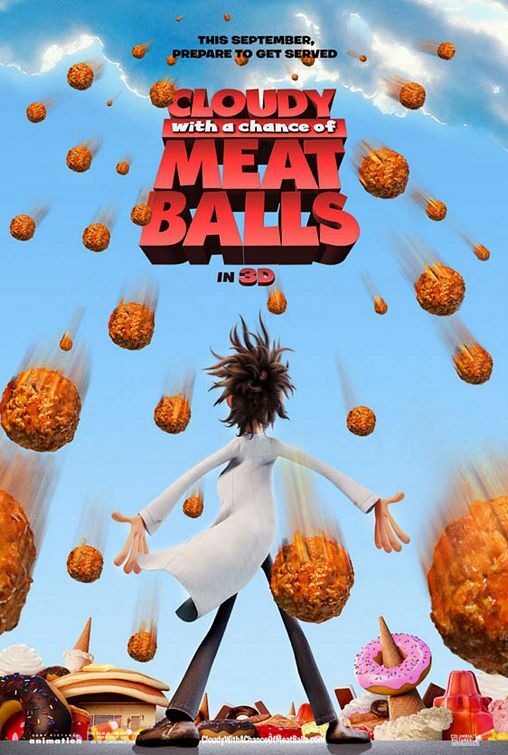 Movies on the Mon kicks off their summer long movie series tonight with Cloudy with a Chance of Meatballs. It will be the firs tin a series of movies this summer. So if you are looking for a little cheap (free entertainment) for the kids, grab your favorite drinks and a few snacks and maybe a lawn chair or a blanket and head on down to the Hazel Ruby McQuain Amphitheater. There comes a time where people like me who try to write a blog every day manage to suffer from the occasional brain fart, where the genius that was going to be used to write a life changing blog post slips away from the brain. For me, this is one of those days where the creative juices decided to take a days vacation and not show up in my cranium. Today is the last day of school for Hayley, she has a couple of finals that she has to make up today because she was sick on Monday. She'll be going to Alabama for two weeks starting early Saturday Morning, providing she stops slamming doors in the morning. Wow, that was quick. 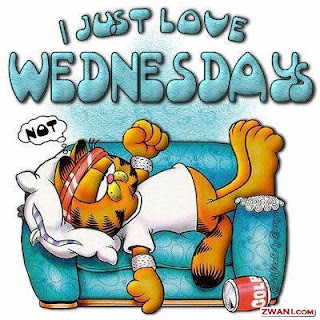 I guess when you don;t work on Monday, Hump Day comes around much faster than a normal week. Anyways we played softball last night and we were once again just not on our game. We dropped a 5-15 decision to Town Hill when they were warmed up and ready to go and we just played very apprehensively. Make no doubt, the better team won last night, but we didn't seem to give our best team effort. We're back in action again this coming Monday at 9:00 and Tuesday at 6:00. Possibly tonight after dinner I might take Sadie for a nice walk weather permitting. It's been a few days for her and I know she loves to get out of the house, she is due for a nice one. We did take her to the dog park over the weekend, but I need to step up the efforts a little. All good things have to come to an end, in this case the good thing that came to an end was my extended four day holiday weekend. Four marvelous days with some very beautiful weather that didn't confine us and allowed us the freedom to enjoy the entire weekend. Now it's back to the grindstone after a rejuvenating weekend with my Sweetie. This evening it is back to the softball field to resume the season after being off since last Tuesday. We hit the diamond at 8:00 tonight and hopefully we can get back on the winning track and start a nice winning streak. We're playing well this season, even our bad games that we lose we are making them very close games, this season should be interesting come August.